I am not being paid to say nice things – I just really like this stuff! I own the entire collection, I think. But I really use a variety of shoes for training and racing. Phases are like my race flats. 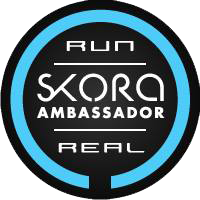 I use them for 5K and 10K races. Tempos for all my long runs and races 13.1 and up. Bases are my go-to for triathlon. The Velcro strap gets me on the run course fast. Fits I use for cross-training. Forms I use on technical trail and winter training. Core I use on middle distance training. Cutest compression socks ever. I like wearing them with running skirts! And of course, recovery. I have been through a lot of headphones and these are the ones I haven’t managed to break. I love that they wrap around my ears so if I catch the cord swinging my arm, they stay on. These keep my toenails from fighting each other and prevent my feet from looking like a crime scene. My favorite socks for running. I race in Oiselle Running apparel. I do wear various brands for training and am happy to provide specifics on trail and cold weather gear! I have a lot of that! I really like Tough Girl Tutus, and Title Nine (which carries Oiselle, Patagonia, PrAna, etc.). I own a lot! And have done a lot of reviews. Moving Comfort seem to be my favorite! I like Body Glide to keep me from getting hotspots! 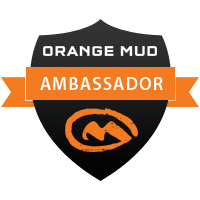 Orange Mud Endurance Vest for long; Orange Mud handheld for short. My helmet of choice for trail and gravel riding. Very cute and the adjusters snug the helmet up to the perfect fit. The liner can be swapped out for a warmer winter one to keep my head warm! My helmet of choice for road cycling and triathlon. Great fit and stays put. I love these socks for biking and for every day. Super comfy. Good cushion. They don’t slip down. And really pretty colors! I have been through a lot of goggles and these don’t discolor or slip off my head. Oiselle swimsuits – they fit great and are beautiful. These suits really do fit all body types and not just the skinny-minnies. I currently swim in an Orca full-sleeve suit. Note; I do not like swimming in wetsuits! I use Tyr caps and transition bags. The caps always match my kits, and manage to contain my very long hair. Also love all the compartments on the bags – I have bags for both training and racing. Shampoo, conditioner, body wash and lotion to keep chlorine from wrecking my hair and skin. Love it. Only thing that takes the tangles out after a swim or rainy run.